To Cite: Bazafkan M H, Hardani A, Afzal Zadeh M R, Amir Zargar A, Orazi Zadeh M, et al. Wound Healing Effect of an Ointment Made From a Mixture of Brassica oleracea var, Punica granatum, and Plantago major L Extracts in Rats, Jentashapir J Health Res. 2014 ; 5(4):e21877. doi: 10.17795/jjhr-21877. Background: In Iranian traditional medicine, Punica granatum, cabbage, and plantago have been used to prompt wound healing. The effects of cabbage, Punica granatum, and Plantago in wound healing have been investigated to some extent, but no experimental study has been performed to assess the impact of an ointment containing all these three substances on wound healing. Objectives: The aim of the present study was to evaluate the effect of an ointment prepared from a mixture of cabbage, Punica granatum, and plantago on local wound healing in Wistar rats. 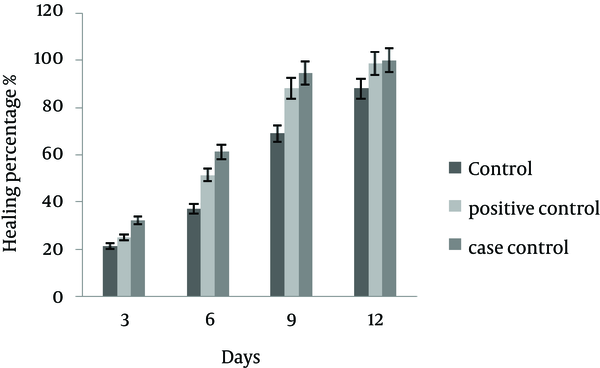 Materials and Methods: This experimental study was performed on 21 male Wistar rats. Firstly, a full thickness wound was created on rats flank, near the spine by a bistoury blade and forceps. Then they were randomly divided into three groups of seven rats as the control group, a positive control group (the treatment group with phenytoin), and the third one received a treatment with studied ointment. The wounds were evaluated on days three, six, nine, and 12. Results were compared by SPSS software using ANOVA test. Results: The average percentage of wound healing in different groups on days 3, 6, 9 and 12 were as follows; 21.3%, 37.87%, 67.39% and 77.17% in control group; 24.98%, 34.21%, 70.74% and 88.55% in positive control group; and 32.35%, 61.27%, 94.53%, and 99.91%, in case group. A significant difference was observed between the control and case groups (P < 0.05). Conclusions: Treatment with the studied ointment could promote wound healing. Nowadays, herbal medicine is used to treat many diseases (1, 2). Continuous efforts have been made to promote wound healing, considering the importance of wound healing, and the fact that failure to treat open cutaneous wounds may lead to local infections and even some malignancies. In addition, there is a lack of highly efficient treatment modalities and possibility of medications side effects (3-5). One of the suggested methods is to use purified biological substances (6). At present, there is a considerable desire toward studying the effects of plants pharmacology, which may be due less side effects, lower costs, and some others (7-10). The ancient Greek name of Punica granatum or Nar (Malus Puniacus) means apple of cartage and its scientific name is derived from "Punicus" meaning Granatum. It is called "Romman" in Arabic and Pomegranate in English (11). The most important metabolites of Pomegranate are polyphenols, especially Punicalagins with strong antioxidant properties (12-14). Punica granatum is an important source of antioxidants, potassium and vitamin C. Function of antioxidants is to reduce or prevent cell damage as the underlying mechanism in many diseases (11, 12). Punica granatum has various therapeutical effects, including antidiabetic, antithrombotic, and anticancer properties, lowering blood cholesterol, sedation, treating the inflammation, killing intestinal worms, treating persistent cough and diarrhea, and prevention of atherosclerosis, asthma and bronchitis. It is considered as a cardiovascular system amplifier, as well (14-18). Studies conducted on topical administration of Punica granatum found healing effects of this fruit (19). Cabbage with the scientific name of Brassica oleracea is known as a member of the Cruciferae family (20). Cabbage is rich in A, B1, B2 and C vitamins. The plant contains alkaloids, sulfuranes, indoles, and isothiocyanate. Cabbage has many therapeutical properties according to traditional medicine, such as sexual stimulation, sound smoothing, knee and joint pain analgesic, narcotic, and invigorator. It is well-known for the treatment of nephritis, diarrhea, bronchitis, cough, swelling, inflammation, and some tumors. It can help digest foods, liver detoxification, and inhibition of gum bleeding, killing of parasitic worms residing in the digestive tract, antianaemia agent, improving vision, kidney stone dissolver, and healing of deep and cancerous ulcers, antihemorrhoids, and treatment of oral aphthous lesions. Cabbage is also a yellow teeth cleaning substance and useful to prevent hair loss, relieving neuralgia, rheumatism pains, and sciatalgia and can be used to remove skin patches. Cabbage leaves contain plenty of calcium and sulfur, which are extremely beneficial for strengthening the blood and the best treatment for anaemia (21-27). Due to high contents of lime, arsenic and iodine of cabbage, it is inimitable to treat bone frailty, anaemia, and tuberculosis. There are sulphate salts, nitrate de potassium, iron oxides, and sulfur (sulfur essence) in cabbage (28, 29). Major Plantago or plantago with the scientific name of Plantago major L, is a member of the Plantaginaceae family. Plantago has been traditionally consumed as a mucolytic, antitussive, and a remedy for itchy throat (30, 31). From long ago, humans have used plantago seeds as an antidiarrheal agent, analgesic, palliative or curative remedy, and a wound healing substance (32). The chemical composition of plantago includes mucilage, organic acids, polysaccharides, and plantagene material of flavonoids, carotenoid, aucubin, Katalpyn, saponins, invertin, apigenin, sorbitol, minerals, vitamins, tannins, resins, gum, sodium, and some others (33). Plantago has been tested by the German Commission E and used in the treatment of cough and respiratory infections, skin inflammation, and blood purification. It is also used as a remedy for heat cooling, respiratory mucolytic, wound healing, treatment of burns, insect bites and stings, treatment of bronchitis, asthma, decreasing blood lipid and glucose levels, and fungal infections. As stated earlier, the effect of cabbage, Punica granatum, and plantago on wound healing have been evaluated in traditional textbooks and scientific papers and abundant studies have been performed regarding the effects of honey and fish oil on wound healing either (34-36). Despite the fact, there is no experimental study available regarding the effect of an ointment containing cabbage, Punica granatum, and plantago extracts on wound healing. Therefore, the aim of the present study was to evaluate the effect of an ointment prepared from a mixture of cabbage, Punica granatum, and plantago extracts on local wound healing in Wistar rats. Plantago was taken from Ahvaz Jundishapur University of Medical Sciences, in late spring 2012; cabbage was provided from suburbs of Ahvaz, Iran; and Punica granatum was prepared from Dezful, Iran in November 2012. Then the materials were identified and confirmed by an academic member. Fish oil and honey were prepared from Khansar, Iran; honey wax obtained from the beehives in Bagh Moin area of Ahvaz, Iran in November 2012. 0.9% Physiologic serum saline (normal saline) was prepared from Daroupakhsh Company (Iran). Ketamine 10% and xylazine 5% were purchased from AlphaSan Company (The Netherlands). Distilled water, disposable latex gloves, specific gloves for animal handling, holding cages for rats were purchased separately. Whatman No. 2 filter papers were obtained from Tajhiz Gostar Company (Iran). Plates for standard food were purchased from animal food manufacturers in Shushtar and Esfahan by the Animal Reproduction Centre. Ethyl alcohol, glycerin, preservatives or protective materials (methylparaben, propylparaben), stearic acid, acetyl alcohol and propylene glycol were purchased from Merck, Germany. Vaseline and liquid paraffin were obtained from Iran Daru Company. Electric mills, Soxhlet extractor, oven or four, centrifuge and sensitive digital scale model 210 Pt, were purchased from Sartorius, Germany and a 6mm punch biopsy was obtained from Iranian Tajhiz Gostar Company. Prepared Plantago, Punica granatum, and cabbage were recognized and identified by an academic member. Then, plants were dried in shadow and powdered using an electric mill. The obtained 70% hydroalcoholic ethanol extract of Plantago, Punica granatum, and cabbage were separately prepared by Soxhlet apparatus with a ratio of 1 to 10 (with a temperature of 60°C for 8 hours). The extract was passed through Whatman filter paper No. 2. The solution was centrifuged for 5 minutes at 3000 RPM; the supernatant was removed and placed in oven at 45°C to evaporate the solvents. The extracts were dried and concentrated individually, then carved with a scalpel, and the ointment was prepared as follows. The ointment contained two separate oily and aqueous phases prepared as follows. The aqueous phase contained water, hydroalcoholic extract of cabbage, Plantago, Punica granatum, protective materials (methylparaben, propylparaben) and glycerine. After weighting, based on the following table, the amount of water required for this phase was prepared in a separate dish and protective materials were dissolved. Afterward, glycerine was added and the dish was put on a Bain Marie at 70-75°C. Then the hydroalcoholic extract was added to prepare the aqueous phase entering the formulation. The oily phase contained Vaseline, liquid paraffin, stearic acid, acetyl alcohol, and propylene glycol, with different melting points. These components were measured according to the following table, and added to the oily phase mixture. Then, the temperature of the compound was set to 70 - 75°C. Values used in the preparation of the ointment were adopted from relevant published articles (35-39). In this experimental study, male Wistar rats, weighing 250-300 grams were used. The sample size was calculated using previously approved projects. As mentioned, sampling was experimental. The rats were randomly taken from the Animal Reproduction Centre of Jundishapur University of Medical Sciences, Ahvaz, Iran. The veterinarian of our group confirmed the health status of rats. Twenty-one adult Wistar rats were obtained from the Animal Reproduction Centre of Jundishapur University of Medical Sciences, Ahvaz, Iran. A day was considered for rats to get used to the new environment. Rats were kept at 25 ± 2°C and light cycle of 12 hours light and 12 hours darkness. Rats had access to water and food ad libitum. 1. The control group, the wound was irrigated daily with a 10% betadine. 2. Experimental group, treated with the ointment mixture of cabbage, plantago, and Punica granatum (the treatment group). 3. Positive control group, treated with a standard solution of 1% phenytoin and 10% betadine. Case and control groups were compared. The healing effect was evaluated at the end of 3rd, 6th, 9th, and 12th days; however, the possibility of healing was not evaluated in other days between these dates (30). The ointment was administered on the wound surface of rats in group 2 from the day zero (the day of wound induction) once daily. The rats were gently held, and anesthetized with ketamine (5 mg/kg) and xylazine (40 mg/kg), preventing the adrenal gland stimulation due to stress. The animal flank was considered near the spine. At first, the hairs of the desired location were shaved by a shaving machine, and then using a razor the area was completely shaved. Then, the animal was situated at the standard crouching position. The animal skin was kept simply stretched between the fingers. A full-thickness wound (by a 6 mm punch biopsy) was created on the dorsal surface near the spine in rats of all three groups. Then the ointment was put on wounds, and thereafter, the rats were returned to their individual cages. Each rat was situated in standard position, then the shape of the wound was drawn with a transparent paper, and finally, its area was calculated by means of a graph paper. The following formula was applied to calculate the percentage of healing. Biopsies were taken from the wounds induced under anaesthesia on 6th, 9th, and 12th days. The tissue samples were placed in 10% formalin and after section preparation, staining with hematoxylin and eosin was performed; eventually specimens were examined pathologically. At first, the wound primary area was assessed. Then the wound area was measured daily from the day zero, and the above formula was used to calculate the healing percentage. The recovery rate was determined based on the pathological parameters obtained according to previous investigations. Score one was given to cases in which re-epithelialization, granulation, and fibrotic tissues were not observed, and a mild acute inflammation was seen in the wound. Score two was given to cases in which re-epithelialization was started from the edge and the bottom of wound; the fibrous tissue formation initiated mildly from the edge of wound and an acute moderate inflammation developed. Score three was given when re-epithelialization was completed in wound margins, and also moderate formation of granulation and fibrotic tissues and severe inflammation were observed. Score four considered for cases in which moderate re-epithelialization, full extent formation of granulation tissue, moderate formation of fibrotic tissue, and acute chronic inflammation were detected. Score five was when re-epithelialization was completed, the granulation tissue was dying down, the fibrous tissue formation was completed, and mild to moderate chronic inflammation was seen in the wound. Score six was when the formation of granulation tissue was degraded and inflammation was mild. Number 5, as the maximum score, was considered in cases of re-epithelialization and fibrous tissue formation. In this method, tissue samples were given to histologists, and each of them reported their own observations independently, without knowing about others opinion. At last, the average interpretations were statistically evaluated (40). Data was analyzed by SPSS v.17 using One-way ANOVA and Tukey’s tests and the results were shown as mean ± standard deviation (Mean ± SEM). P values less than 0.05 were considered as significant (41). Rats had free access to water and food (standard food as a pellet) in all groups and cages were cleaned periodically. Anaesthesia was induced by ketamine and xylazine. Wound healing process was assessed macroscopically and microscopically. In macroscopic evaluation, wound healing percentage on days zero, three, six, nine, and 12 after the injury was evaluated, and compared with those of positive control and control groups. For microscopic evaluation, two samples were randomly selected from each group in days three, six, nine, and 12. These samples were delivered to the pathology laboratory. After data collection, the results were analyzed as mean ± SEM and standard deviation, using SPSS v.17 software by One-way ANOVA and Tukey’s tests. On the third day, there was a significant difference between the mean ± SD in wound healing in the control groups (P < 0.05). Although, the difference between case and positive control groups was not significant (P = 0.084). On sixth day, there was a significant difference between mean ± SD of wound healing in case and control groups (P ≤ 0.03), whereas the difference between the case and positive control groups was not statistically significant (P = 0.065). On ninth day, there was a significant difference in mean ± SD of wound healing between the case and control groups (P ≤ 0.02); while, the difference was not significant between the case and positive control groups (P = 0.063). On the 12th day, there was a significant difference in mean ± SD of wound healing between the case and control groups (P ≤ 0.035); while despite better healing process the difference was not significant between the case and positive control groups (P = 0.06). The results of macroscopic studies are shown in Table 1 and Figure 1. The mean ± SD in percentage of wound healing was significant between the control and case groups, while it was not significant between the case and positive control groups. 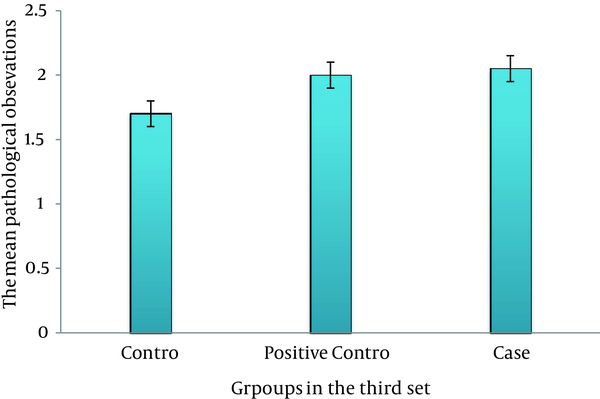 On third day, there was no significant difference between the case, control, and positive control groups (P > 0.05) (Figure 2). On sixth day, there was a significant difference between the case and control groups (P ≤ 0.035); this association was also seen between the case and positive control groups (P ≤ 0.05) (Figure 3). 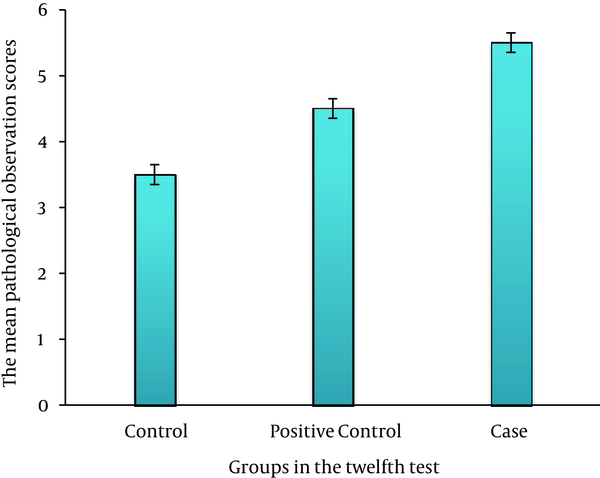 On ninth day, the results showed a significant difference between the case and control groups (P ≤ 0.017) and between the case and positive control groups (P ≤ 0.038) (Figure 4). At last, on 12th day, there was a significant difference between the case and control groups (P ≤ 0.009); a significant difference was seen between the case and positive control groups, as well (P ≤ 0.027) (Figure 5). There was no significant difference between all studied groups (P > 0.05). There was a significant difference between the case and control groups (** P ≤ 0.035). A significant difference was seen between the case and positive control groups, as well (* P ≤ 0.05). There was a significant difference between the case and control groups (** P ≤ 0.017). A significant difference was seen between the case and positive control groups, as well (*P ≤ 0.038). There was a significant difference between the case and control groups (** P ≤ 0.009). A significant difference was seen between the case and positive control groups as well (*P ≤ 0.027). Ulcer is defined as a disruption of histological structure of skin due to injuries resulting from physicochemical or biological factors (42, 43). Wound healing is a complex and systematic process, which includes four stages as the hemostasis phase, the inflammatory phase, the proliferation phase, and the differentiation phase (44, 45). Wound healing is one of the most fundamental issues which humanity has faced since its creation. Therefore, various medications have been used to promote wound healing (46, 47). The present study showed a significant difference between the case and control groups regarding macroscopic evaluation of the wound, which was more prominent on the sixth and ninth days. 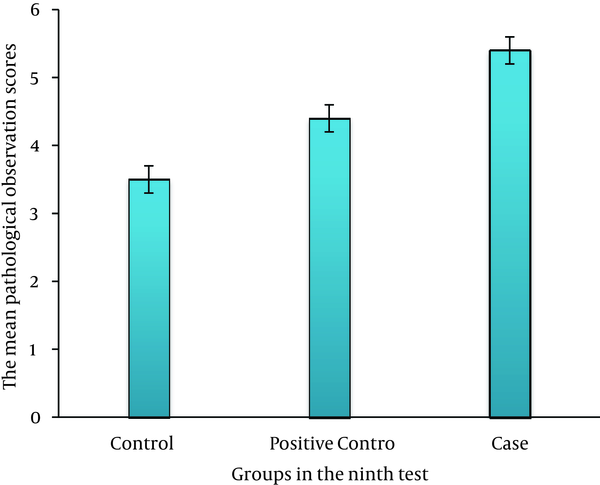 There was no significant difference between healing percentage of case and positive control groups; although t more healing was observed in the case group. An interesting point in comparing P values between the case, control, and positive control groups on days three, six, nine, and 12 was that P values were 0.084, 0.065, 0.063, and 0.06, respectively, indicating a trend toward P = 0.05. It suggests the possibility of obtaining significant results between the case and control groups on days 13, 14, and 15 if rats had been followed up. In microscopic studies, there was no significant difference between the control, positive control, and case groups regarding histological evaluations. 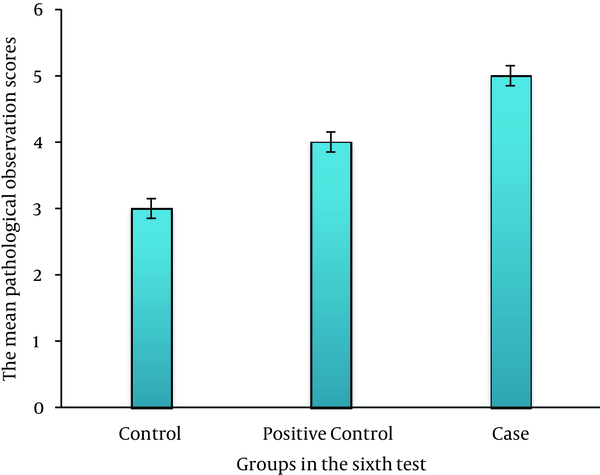 However, a significant difference was found in wound healing between the control, case, and positive control groups on days six, nine, and 12, indicating more microscopic healing in the case group. Herbal ingredients of the ointment were completely new; hence, no similar paper has been published up to now. Therefore, to compare it with previous studies, it seems reasonable to consider the main ingredients separately. Hadipur et al. in a study performed to assess the effect of Punica granatum extracts to protect knee joint cartilage from an experimental model of osteoarthritis, introduced iron as a dominant mineral in Punica granatum. It also contains other minerals including Mg, K, Cv, Cs, Cr, Co, Cl, Ce, Ca, Zn, Sr, Sn, Se, Sc, Rb, Na, Mo, and Mn. Anti-inflammatory effects of Punica granatum were observed even at low doses clearly. Punica granatum was used in our ointment due to its anti-inflammatory effects, therefore higher healing rate compared to Hadipur’s study seems to be reasonable (48). Toi et al. conducted a survey and showed antiangiogenic potential of Punica granatum for the first time, but in this study Punica granatum seed oil and fermented juice were used (49). They showed that polyphenols existing in these two parts of the Punica granatum could exert antiangiogenic properties. It was reported that Punica granatum juice and seed oil could affect cancers of prostate, breast, skin, colon, lung, mouth, and blood, through its antioxidant, antiproliferative (growth inhibition, cell cycle disruption, and apoptosis induction), antiangiogenesis and anti-inflammatory mechanisms (18). Plantago major L has been examined by the German Commission E and recommended for the treatment of cough, respiratory infections, and skin inflammation (50). According to the presence of Plantago major L extract in our ointment and its healing effects, the results of this study were consistent with the recommendation of German Commission E.
Taghavi et al. showed that topical fish oil promoted wound healing in rats with chronic diabetes, due to its rich omega-3 fatty acid contents, whereas the healing process was delayed by using corn oil, because of its omega-6 fatty acid (51). Therefore, in the present study, fish oil was used as one of the ingredients of ointment and our results were consistent with these two studies. Hasanzadeh et al. investigated the effect of a mixture of Brassica oleracea L. and albumen on burn wound healing in rats. They found that topical application of cabbage extract and albumen once daily improved healing of burn wounds of second degree in rats; although this effect has not shown any significant difference with that of silver sulfadiazine, and was almost the same (52). Isbir et al. in a study entitled “The effects of Brassica oleracea var. capitata on epidermal glutathione and lipid peroxides in DMBA- initiated- TPAPromoted rats” found that cabbage could activate glutathione-dependent natural antioxidants, which are extremely important in skin protection (53). Srivastava et al. in a study entitled “Antitumor promoting activity of indole-3-carbinol in mouse skin”, indicated that indole-3- carbinol existing in cabbage has anticancer properties and inhibits progression of skin cancer in mouse (54). In these three studies, researchers confirmed that cabbage accelerates wound healing of burn injuries, protects the skin, and prevents progression of skin cancer in rats. Regarding the use of cabbage extract in the ointment of the present study, consistency of these three studies with the present one could be concluded. Dill et al. reported facilitatory effects of phenytoin on fibroblasts of muscular tissue and tissue growth factors (55). Song S et al. showed an increase in the number of macrophages within wounds treated with phenytoin (56). According the study of Modaghegh S et al. topical application of phenytoin enhanced wound tensile strength, neovascularization, collagen synthesis and fibroblast infiltration (37). Comparison between the control, positive control, and case groups revealed that topical application of the ointment was more effective in wound healing in both macroscopic and microscopic evaluations. Therefore, it is possible that same functional mechanisms of phenytoin in the enhancement of histological wound healing could be attributed to the ointment made of Brassica oleracea var, Punica granatum, and Plantago major L, even with more potency and efficiency. Regarding the mechanisms involved in wound healing, the ointment probably accelerates wound healing through reducing tissue swelling or inflammation. Modulation of the wound inflammatory phase leads to wound healing acceleration (57). In a study performed by Riahy et al. entitled “Effect of topical application of phenytoin and honey in the closure of an open wound in male rats”, it was found that honey and phenytoin accelerated the closure of wounds compared with the control group; the healing in the group treated with phenytoin was faster (58). Oluwatosin et al. performed a study entitled “A comparison of topical honey and phenytoin in the treatment of chronic ulcers”. Twenty patients with gunshot wounds previously treated with betadine for 12 weeks were assessed, but their response to treatment was very low or not at all; patients were cured with phenytoin within two weeks (59). Lodha et al. in a study entitled “The Role of phenytoin in healing large abscess cavities” compared the healing effect of topical phenytoin with normal saline in 100 patients. After four weeks, the mean reduction in ulcer size in phenytoin- treated and control groups were 72 and 55 percent. Phenytoin was evaluated in the treatment of gluteal abscess by Lodha and colleagues. The control group was treated with eusol and urea solution. The cure rate in the phenytoin- treated group was 10 days, while it was 20 in the control group (60). Three studies mentioned above, declared the preference of treatment with phenytoin compared to saline and betadine, which was consistent with the results of the present study regarding further improvement in positive control group than the control group. One of our limitations was tissue staining, since the present histological study was performed with hematoxylin-eosin staining. It is recommended to perform specific staining including Masson’s trichrome staining for deposition of collagen, and immunoperoxidase staining for vascular evaluation in future studies, to achieve more complete histological evaluations. Furthermore, in addition to measurement of the wound area, one of the methods in wound assessment is to evaluate wound surface tensile strength by means of a tensiometer, which was not performed due to lack of access to this device. In conclusion, treatment with a topical mixture of Brassica oleracea var, Punica granatum, and Plantago major L can accelerate wound healing. Hereby, we would like to appreciate all staff, especially Mr. Oraki, the charge of the Student Research Committee of Ahvaz Jundishapur University of Medical Sciences, who supported us to obtain required permissions to perform the experiments. Besides, we are sincerely grateful to all workers of Animal Care and Reproduction Centre of Ahvaz University for their great cooperation. 32. All about plantain herb weed Plantago major article research.